Although portable music players seem like a rather recent invention, they have existed in some form for hundreds of years. The one above was built in 1890 by famed Parisian automaton maker Blaise Bontems. It faithfully reproduces the sound of a bird singing beautifully via a complex series of moving parts. It was restored by Michael Start of The House of Automata. 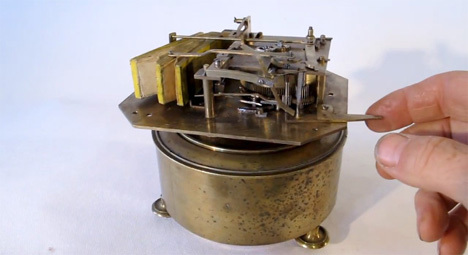 The sounds created by this 120 year old gadget are surprisingly realistic. The bellows, gears and springs all work together to make a song that is lovely and sounds just like a live bird. The electronics of today might be able to record actual birdsong and play it back, but they can’t invent sounds from intricate moving parts like this antique. And in our humble estimation, those invented sounds are far more compelling than the reproduced ones. See more in Antique Gadgets or under Vintage & Retro. March, 2013.